Is This Your Bedazzled Pigeon? The Hot Duck has arrested our attention for weeks now, but there’s a new bird captivating the internet this week: the Bedazzled Pigeon. And this bird with flair is already in high demand. Jody Kieran, the owner of the Arizona-based bird rescue and rehabilitation center Fallen Feathers, tells Gizmodo that the male pigeon came into her care last Sunday after someone in her community contacted her about a bird outside of their home with something odd on it. Kieran told the caller to catch the bird and bring it on over. When they showed up with “the pigeon wearing the thing,” Kieran said she wasn’t sure what to expect. Flight suits are used to capture bird poop while the bird is out of its cage. They’re basically bird diapers, but more stylish, as is evident by this pigeon’s rhinestone-adorned vest. And assuming it didn’t bedazzle its own flight suit, it’s clear it belonged to someone who probably cared about it. “I have been doing bird rehab for over 20 years now—I take in over 2000 birds a year—and normally wild birds arriving with clothing is enough proof to me that this bird was owned and loved,” Kieran says. What’s more, this bird has personality. Kieran describes him as sweet, attentive to the humans around him, and down to hang. She said he recently enjoyed watching the Sundance Kid and eating popcorn with her daughter, which led to Kieran joking that he appreciates westerns. It’s been a week since the pigeon came under her care, and the bird’s rightful owner has yet to come forward. Kieran will wait the typical 30 days before she’ll settle the bird with a new home. She says she’s already got a waiting list of potential adoptees. 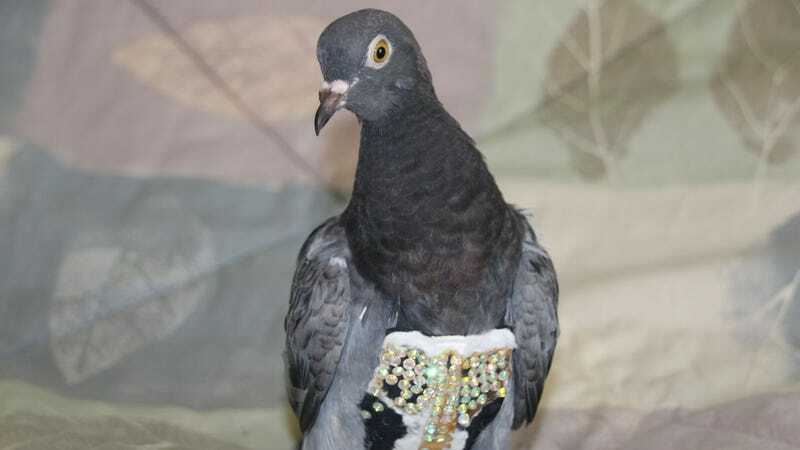 If this is your handsome, bedazzled pigeon, move fast. He won’t be without a home for long. 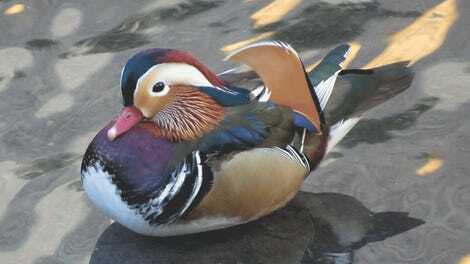 The Central Park Mandarin Duck Went Missing. I Tried To Find It.